I believe companies, and particularly GNB-type companies, need to get three things right to enjoy sustainable success: idea, execution, and culture. Great companies start with an inspiring belief or question. For example, the idea behind Atomic is a belief that there are better ways of building software. Our belief has been consistent from day one even though we’ve evolved our service offering quite substantially in ten years. Simon Sinek has a book and TEDx talk about this sort of idea (he refers to it as your “why”). As this chart shows, a brilliant idea with no execution is still just a $20 idea. Execution involves delivering value to your clients or customers and running your business profitably. 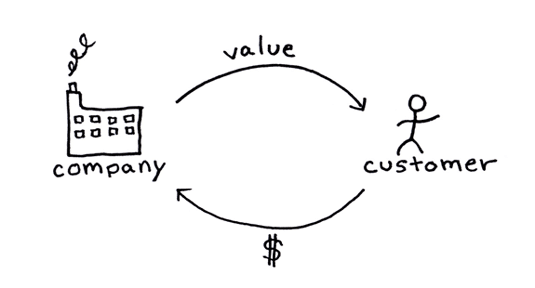 At its core, every business in the world operates according to the simple diagram below. The myriad of issues and considerations to actually execute on your idea are where you roll up your sleeves and get to work. I believe culture is the most important factor of all, especially for companies like ours. The reason culture is so important is the primary role people play in these companies. Every company obviously benefits from good people, but firms like Atomic typically have very few assets other than their people. Innovation and creativity can’t be manufactured, so you need to have a strong culture to recruit great people and support, challenge and inspire them. 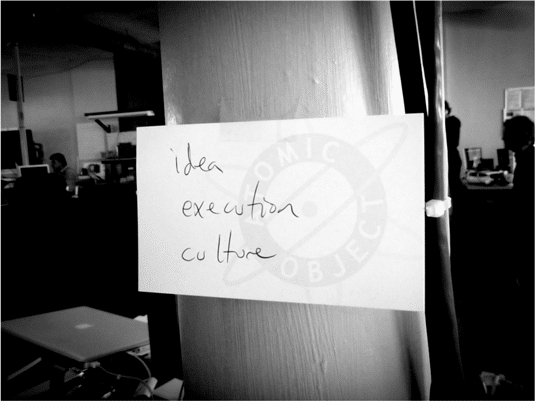 I’ve written more about the three factors of idea, execution and culture in a recent Rapid Growth guest blog post. I enjoyed Chris Savage’s observations about what can’t possibly work if your culture doesn’t support them (decision making, hiring, marketing). The nice flip side to this is if your culture DOES support these things you’ve made three really hard things much simpler. Carl – I like how you have captured your own experience in idea/process and put numbers to it. I often look at execution as the critical step to make the idea impactful – whether it is to impact the income statement, the world around us, or both. I see culture as the piece that sustains the execution – because execution is work, and at some point it will sap the energy of the people doing it. Culture provides a glue for individuals/teams to do their work and be fed by the environment and relationships that surround them. That’s a cool way to look at it, Scott. Execution is work, work is at some level what have to do (versus pure play), culture helps makes it sustainable. Very nicely put.